But this whole hobby is about indulgences, isn't it? I just acquired this little beastie. Hot off the presses from those fine people at Rapido Trains. The GMD GMD-1 is a diesel locomotive originally produced by General Motors Diesel (GMD), the Canadian subsidiary of General Motors Electro-Motive Division, between August 1958 and April 1960. This switcher locomotive was powered by a 12-cylinder EMD 567C diesel engine, capable of producing 1,200 horsepower. The GMD-1 was built on either Flexicoil A1A-A1A (for light rail prairie branchlines) or Flexicoil B-B trucks. 101 examples of this locomotive were built for Canadian railways. 96 went to Canadian National Railway and the remaining 5 went to Northern Alberta Railways (that later became part of CN's fleet when they acquired majority interest in NAR). Admittedly this unit is way out of era for me. But they are in a class of locomotive that I term, "So ugly they're beautiful". And a surviving unit still plies the rails between London and St Thomas from time to time. The model is very nice. Lots of nice detail, the sound decoder sounds just like the unit I get to hear from time to time. This will probably be the only Rapido Trains purchase I'll ever make, but right now I have no regrets. Particularly since they've put so many images on line. Elgin County Archives is a treasure trove of delights. Images from over 120 years of history. And for us train nuts, lots of old railroad images. The original Canada Air Line bridge and the replacement built by the Grand Trunk crossing the Kettle Creek in St Thomas. This scene is a 5 minute walk from my house. I'd love to find more history on the replacement project. There are a number of steel trestles on the old Air Line right of way that are similar in design and I'd really like to know if they shut the railway down for the length of time it would have taken to replace all the wooden bridges on the line. It makes a certain amount of sense given that the option for shoo-flys around the old bridges is pretty limited, if not non-existent. Today the steel bridges are in such poor repair that the shortlines in the area refuse to cross them and the owner, Canadian National, is showing no inclination to repair them. Really cool stuff in my backyard. Literally. This was dug up in our yard a few years ago. Now I'm not exactly sure what this item is for, but it sure is neat. Clearly it's from the old Great Western Railway and maybe tagged a 1/2 cord of wood , maybe for locomotive fuel. In 1869 the Canada Air Line Railway was chartered by the Great Western as an alternate route to the Canada Southern. 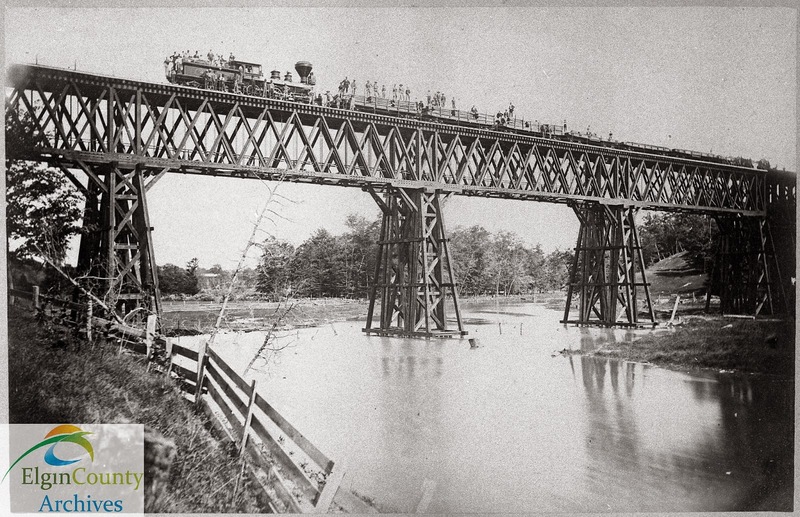 It ran in a direct line (as the crow flies) for a distance of 150 miles from Fort Erie through Welland Junction (Dain City), Canfield, Tilsonburg and St. Thomas to a junction with the Great Western at Glencoe. The Canada Air Line Railway became part of the Great Western in 1871 prior to completion in 1873. The Great Western Railway became part of the Grand Trunk Railway in 1882. 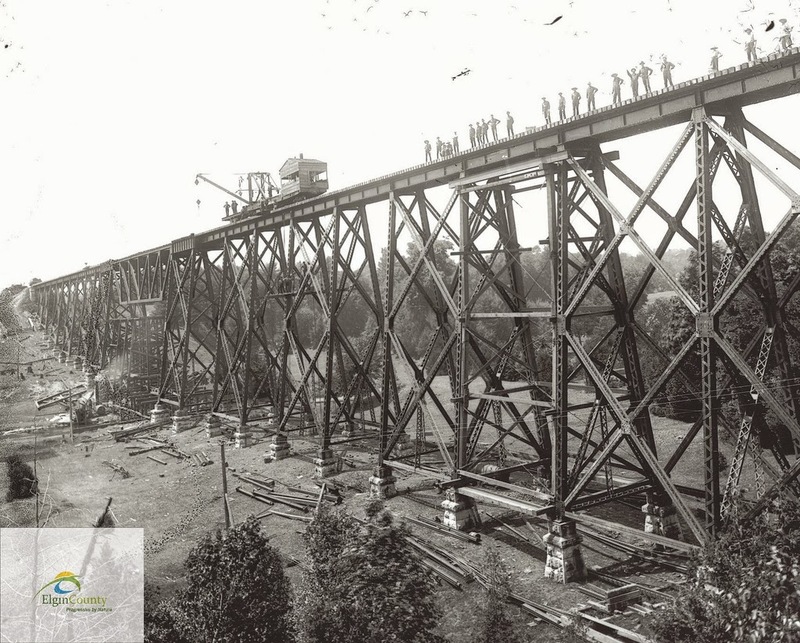 The Wabash Railway negotiated running rights with the Grand Trunk in 1898. And my house is 1/2 a block from the St Thomas Wabash yard. Which is a bit of a migration for this disc. No doubt there's a story here, sadly I'll probably never hear it. I don't think so, but Trevor Marshall just sent me 6 images of resin cars I've built for him, in part prompted by my post of the cars I built for Jim DuFour. These are all S scale models. Built and painted by me. Trevor weathered them himself, along with adding the Sergent's couplers. I model the summer 1951. And at that time many homes, if not most homes, were heated by coal. Oil was starting to make in roads and natural gas was on the horizon, but coal was king. Anthracite to be even more specific in Southwestern Ontario. A very good summation of retail coal traffic was written some years ago by Ian Wilson. You can see what he had to say here, http://www.canadianbranchline.com/retailcoal.htm . Give it a quick read, I can wait. Inspired in part by Ian's article I wanted a few coal hoppers for some of the roads indicated in the article. And my initial online searches weren't very fruitful. Now I know that Bowser and Accurail offer hoppers, they are cruder models than I want. Cast on grabs and ladder rungs, etc. And the Westerfield hoppers tend to be of an earlier era than my chosen timeframe. But with the help of my friend Bob Heninger, I found the cars and the decals I wanted to replicate the coal traffic I knew to be so important for keeping us warm in those nasty Canadian winters. I acquired 3 Intermountain cars painted for the Erie and purchased 6 Kadee hoppers undecorated and used Microscale and Highball Graphics decals for the Reading and LNE cars. I think that should cover it very well for bringing anthracite into the region. In truth, I don't get enough of this kind of photo. I very recently built these 2 cars for Jim DuFour and he very kindly sent me these images of the cars in service on his stunning layout. 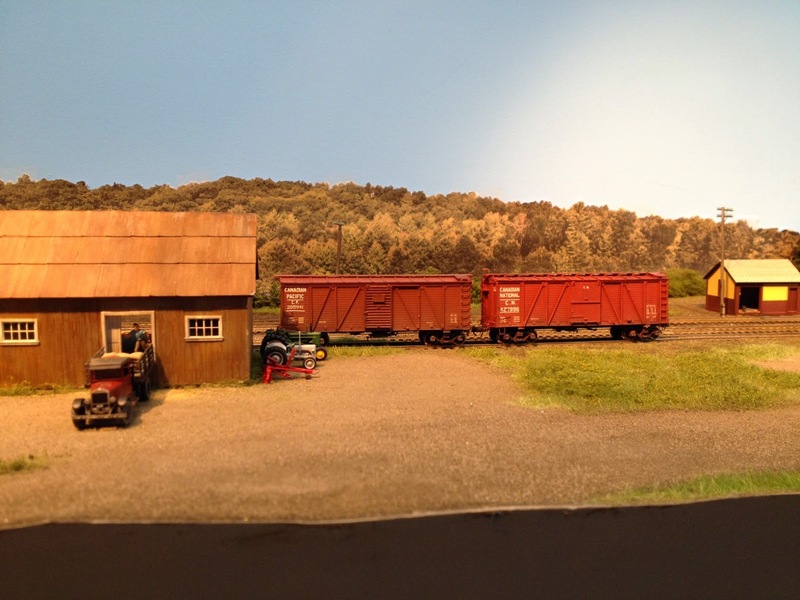 I was fortunate to be able to see Jim's layout a couple of years ago when I went to the Springfield railway show for the first time. I'm rather honoured to have my work grace his layout. The great scenery machine is grinding it's way towards the tiny hamlet of Renton. About halfway between Jarvis and Simcoe, this little place hosted a stockpen and a coal dealer in the era I am modeling. Boston Road, as it's called on the survey I have, known today as either Provincial Road #5 or Cockshutt Road, will make for a nice little bit of scenery. Given the remoteness of the location I felt that a dirt road was in order, and this is how I created it. I started with a base of 0.060" styrene for the roadbed and a plank crossing. The edges of the roadbed were filled in with a bit of Scupltamold and the whole thing given a basecoat of "earth" coloured paint. Once that was dry, I brushed on a coat of Weldbond glue and spinkled the surface with "dirt". The product I used is this lovely stuff from Scenic Express. Nice colour and nice texture. Once that was dry and the excess vacuumed up, I ran a scale vehicle over the surface to show tire tracks. The stockpen will be added in the flat area just to the left in this photo and the retail coal dealer further to the left from there. With the road done the "greening machine" can now come up to the roadway. Did somebody call for a static grass applicator?